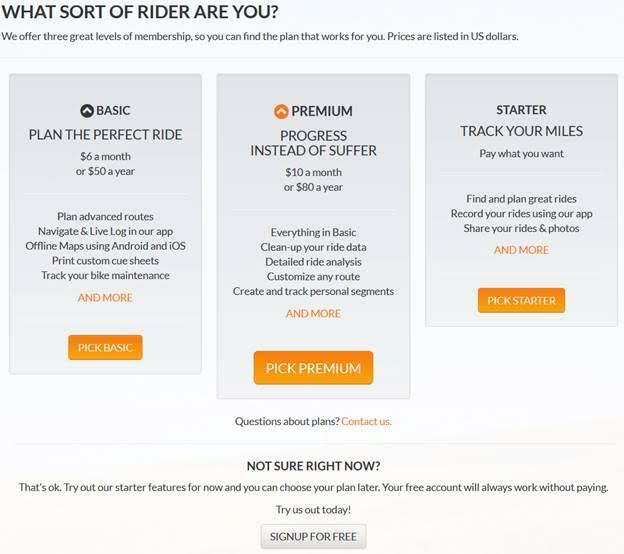 Ride with GPS has several membership classifications and price levels available. Each price level provides different features and functionalities. The Free membership option is listed at the bottom of the screen. Clicking on it will allow you to establish a free membership. You can also register for a free membership by selecting the Starter package and entering $0. The free membership is all that is necessary to download the app to your cell phone, to download the club routes to the cell phone app, and to generate pdfs of club routes on the Ride with GPS website for printing on your computer.